Remove the center console side finishers (1) (LH/RH). Remove the center console side finisher screw (A) (LH/RH). Release the clips using a suitable tool, then remove the center console side finisher. Remove the shift selector finisher (1). Remove the shift selector screws (A). Release the clips using a suitable tool, then remove the shift selector finisher. 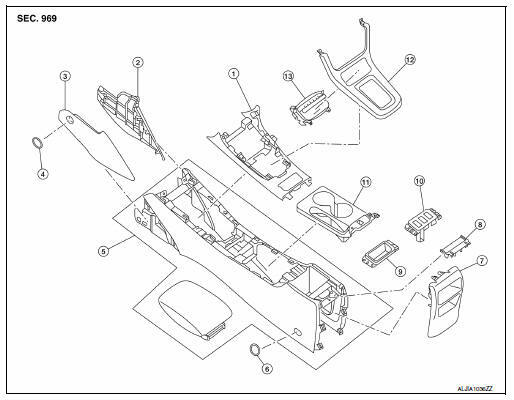 Release the center console cup holder finisher clips, then remove the center console cup holder finisher (1). 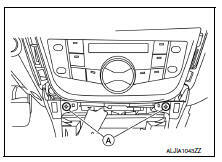 Remove the center console screw cover (1) using a suitable tool and the center console screws (A) (LH/RH). Remove the remaining center console screws (A). Disconnect the harness connectors from the center console assembly and remove.